James Wheeler was born in Albany, Georgia on August 28, 1937. Wheeler didn�t follow the usual path of listening to the blues and picking up a guitar as a youngster. His favourite music as a youth was the big band sounds popular in the day. Folks like Joe Stafford, Glenn Miller and Duke Ellington. �I like to tell people that I came in at the college level and down to the starters level. That was the sound that I had to listen to. Louis Jordan was my main man. He was my idol for a long time�. Wheeler never even played an instrument until he moved to Chicago in 1956. Nineteen and ready to a change in life, James Wheeler headed north to join his older bother Golden Wheeler in Chicago. Golden had come to Chicago a decade earlier and got caught up I the sounds of the city. He was fascinated with the sound of the harmonica and after Little Waiter befriended him he began to learn to play. As soon as little brother James arrived in Chicago he was thrust into the sounds of the blues. Golden was playing with Waiter Smith, Donald Griffin and Johnny Swan at the time, and occasionally jamming with Eddie King and harp player Willie Black. James began to thump around on the guitar when hanging out with the gang, and eventually picked up an old Harmony acoustic guitar with a pick-up in it. James began to see bluesmen like Howlin� Wolf and Freddie King playing in the clubs, and his interest peaked. By the early 1960�s Wheeler was jamming regularly on the West Side and landed a steady gig with Billy Boy Arnold at the Club Arden. In 1963 Wheeler decided to form his own band. The Jaguars consisted of Wheeler on guitar, bass player/vocalist Johnny Howard and drummer Sam Burden. The band cut their teeth at the King James Club on 111th St. but their first big break came when they filled in for Syl Johnson at the Just Me Lounge at 59th and Morgan. This gig opened the doors to various house band stints including stays at the Bonanza, Just Me Lounge, Payton Place and the Burning Spear. During the next ten years, Wheeler played behind blues greats like McKinley Mitchell, B. B. King, Millie Jackson, Otis Clay and O.V. Wright. After The Jaguars broke up in 1972, Wheeler was enlisted to for Otis Clay�s touring band, the OCB�s. He stayed with Clay for the next three years and in 1975 went on tour with The Impressions. For the next decade Wheeler held a day job and only played on the weekends with guitarist Buddy Scott. Wheeler�s next break came in 1986. �One evening when I got home my brother called and said some people had been trying to find me. I asked who it was and he said Otis Rush. So I got in touch with him and he said: �Look I�ve got to go into the (Kingston) Mines this weekend and need a guitar player�. So I said �O.K just for that weekend,� you know. Little did I know it would last for 7 years�. It was Rush that encouraged Wheeler to start singing and made a spot for him singing in his show. Wheeler left Rush in 1993 to join the band Mississippi Hat and made three records with them. Lately, Wheeler has done a stint with Magic Slim and currently works in Willie Kent�s band. Since the above was written James has produced another cracking album for Delmark Records named �I Can�t Take It� and he has had two mini tours in Britain; the first of which garnered a recording session for Paul Jones� BBC Radio 2 show. 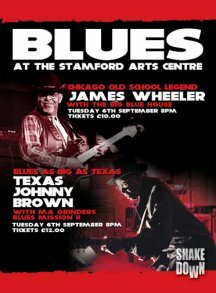 The second tour included his Shakedown Blues debut together with the fine Al Dean Band. There is also a fine bootleg of one of his �Live @ The Kingston Mines Shows� � worth knocking on some doors for.